At the beginning of the year I had 3 big goals (more goal than resolution in my case,) for 2018.
and learn to make sourdough! An expert sourdough baker I’m not, but since starting late spring I’ve learned a ton from trial and error, and wanted to post about it for any of you sourdough hopefuls out there. This way I can point you in the right direction of what has been useful for me, and build on that as I continue to learn! I also have wonderful recipes for sourdough waffles and sourdough pizza crust that I’d like to share and this seemed like the natural first step! My starter ready to be fed again. 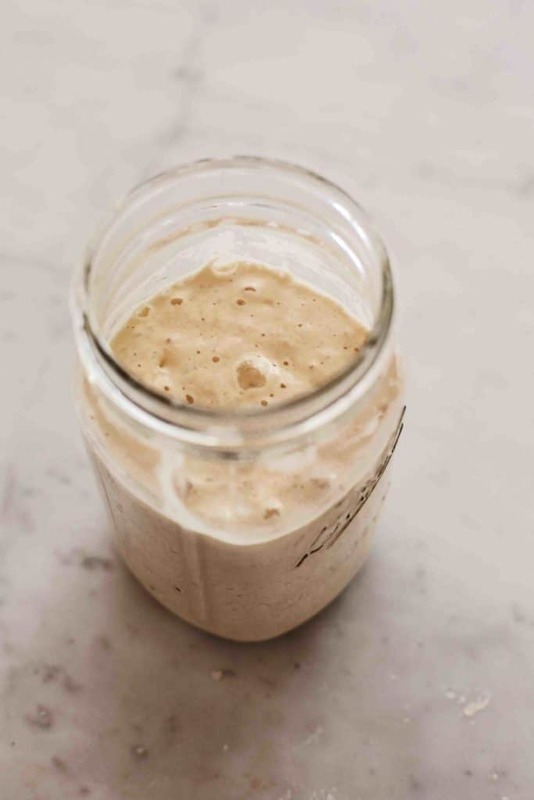 The key to making sourdough is of course sourdough starter. I feel like I cheated a little bit here because I was given some starter from a foodie friend who was lucky to have a really wonderful, well established starter. Because of this, my bread turned out pretty great by my 2nd attempt and I’ve had very few failed attempts in the 20 or so loaves I’ve made in the last few months. Obviously not everyone is going to be able to get their hands on a well-established starter so I’m here to talk you through your options. Look at those bubbles! These two dough rounds are ready to go into the fridge to ferment some more overnight! 1-Ask around in your local groups for anyone that has some well-established starter. I hate wasting starter so am always happy to share mine with my friends and neighbors who have reached out. Chances are someone you know has some and is willing to pass some on. (Or buy some starter from King Arthur’s Flour! A comment below let me know that they sell great starter so you can get started.) It’s fresh starter too so it should work well. 2-Play the long game and make your own. It’s totally doable, and only takes a few weeks to get it going- and soon after you’ll have well established starter of your own to pass along. Now I didn’t go this route so I can’t write about it, but I have some great resources. The blog The Perfect Loaf is a must read/follow as you being this journey, as Maurizio has tons of wonderful insights and information. I didn’t follow his recipe for the bread itself, but I know several people who have had a lot of luck with his starter method which can be found here. 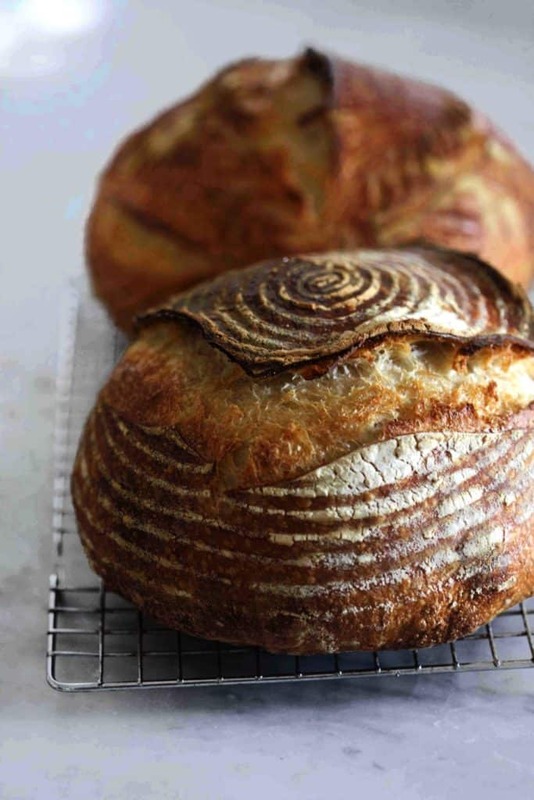 For my bakes I use the method found in the Tartine cookbook, which I have found so useful in this process. My copy is so full of flour and sourdough starter the pages are stuck together, but that’s what we are going for right? The recipe is below- please comment below with any questions! This here is my ideal crumb structure. Amazing texture, but a nice surface for sandwiches and toast without the toppings falling through! 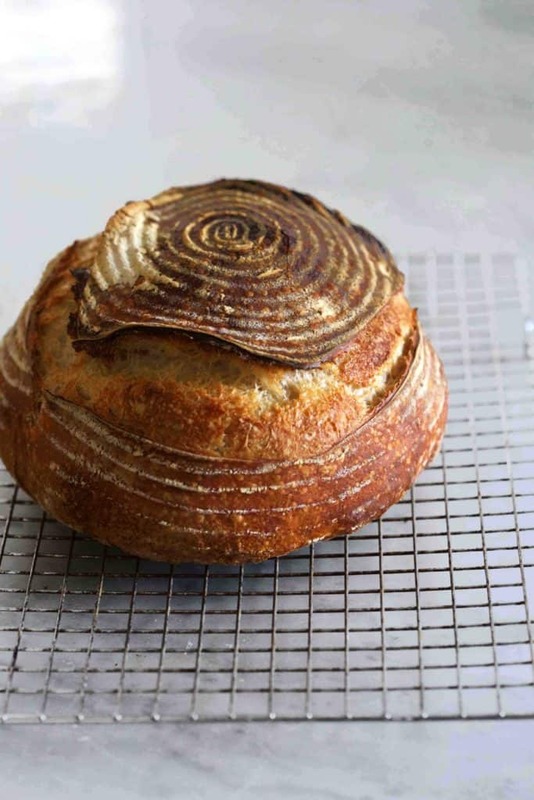 One note on special supplies for bread baking before the recipe: there are a few things that have been very helpful in my bread baking, some more essential than others. 1- A kitchen scale. This one is a must. All the ingredients are weighed vs. being measured by volume and it’s important to have that precision when making your dough. 2-Banneton or proofing basket. This one is definitely optional, I have one and usually make 2 loaves a go, using a round, towel-lined bowl for the other. I do like the ridge pattern that comes from using the basket though, and it’s the perfect size for the loaf. 4- Dutch oven or Cast Iron Combo Cooker. A sturdy, covered cooking vessel is needed to trap steam and help your bread get that perfectly crusty crust and soft pillowy texture. I use my 5.5 qt Le Creuset, but it’s not idea to be honest. Dropping the dough into the deep pan can be tricky at times. I plan to add the Lodge Combo Cooker onto my Christmas list this year- it’s inexpensive and really easy to place your dough on, cover and put back in the oven. Combine 1 tablespoon mature sourdough starter with 100 grams of white flour, 100 grams of WW flour, and 200 grams of warm water. Stir together and cover with a kitchen towel. Let the leaven rise overnight in room temperature. The next morning, check your leaven to see if it's ready by dropping a small piece into a bowl of warm water and seeing if it floats. If it does- you're ready to go. If not, give it a little more time and try again. When ready, add 700g of warm water (80F is recommended by Tartine but I have never taken the official temp of my water.) Mix the leaven and water together with your hands. Add 900 grams of white flour and 100 grams of whole wheat flour and mix together with your hands or a dough spatula until no dry bits remain. Cover with a kitchen towel and let sit for 30-40 minutes. At this point add 50g additional water and 20 g salt, mixing with your hands until well-combined and slippery. At this point you begin a series of "turns" 30-45 mins apart, that allow the dough to aerate and ferment. To turn the dough wet your hands and lift the dough from underneath, stretching it up and over. Repeat on the other side, and then cover again. This gives the dough structure and helps it hold shape when you bake it. As the dough ferments and bubbles form, you want to be gentle with this process so to not deflate it. Turn the dough onto a lightly floured counter top and divide equally in half. 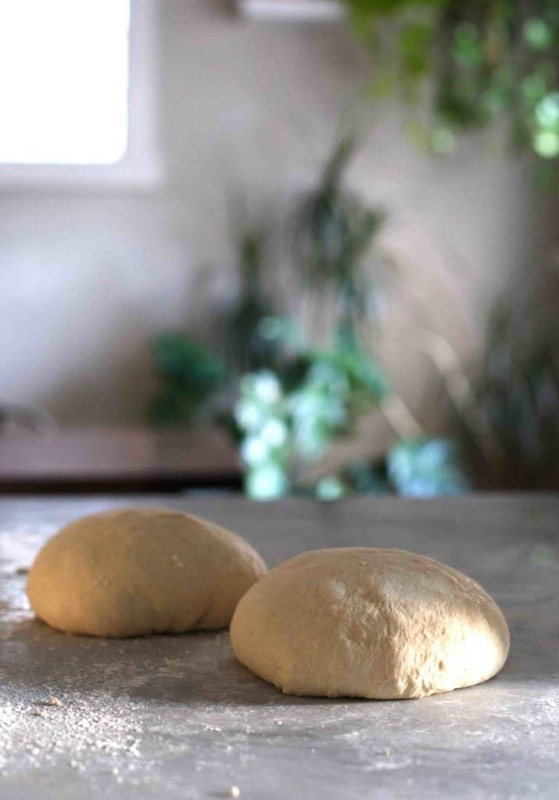 Using as little flour as possible, and a gentle touch, pull the edges of the dough gently over, stretching it bit from all sides to form a round shape. (This phase is slightly difficult to describe, I'll try to make a video of it at some point!) Flip the dough so the smooth side is on top and the tucked in side pieces are under. Cover the rounds once again with the towel and let rest for 20-30 minutes. After the bench rest, form the dough into a nice round one more time by flipping the dough over, lightly stretching and pulling the edges into the middle, and flipping it back right side up. The dough is now ready to place inside a floured, towel-lined bowl or basket for an overnight fridge fermentation. Make sure to generously flour the clean towel that you use to line your bowl, even on the top of the dough. Cover and chill until the next morning. When you're ready to bake, preheat the oven to 500F with your cast iron or covered baking pan inside. Preheat the baking dish for 20 minutes. Carefully remove the dutch oven from the oven, and carefully place the dough inside. (I like to place it on parchment and drop the whole thing in. I for one as I am sure there are others measure in cups and so on, it would be nice if you could put in both measurements. This recipe sounds interesting to try. Hi Debi! Thanks for your comment. I always post my recipes with cup measurements, but this specific recipe just won’t work that way. There are so many factors like climate, and elevation, that I think measuring by volume would result in lots of failed loaves and people would be upset. Also- I never measure in cups for this so I don’t have a way to convert. 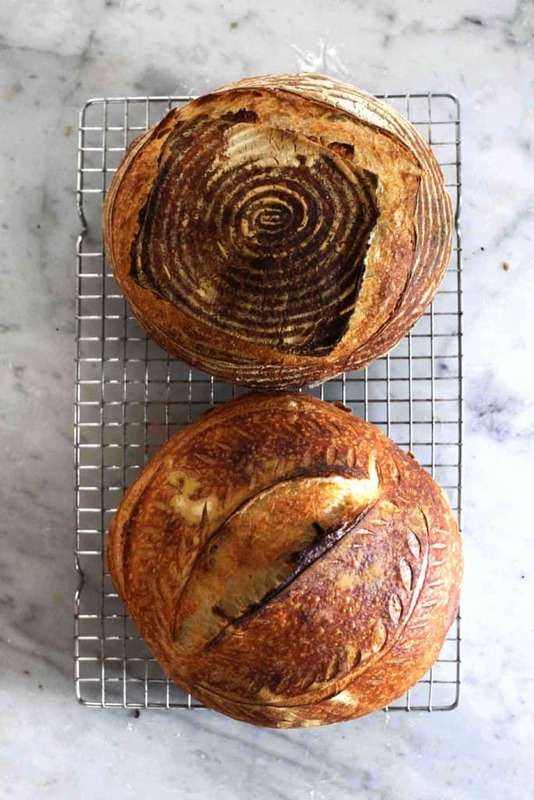 I’ve been making sourdough for a couple of years using the method on The Kitchn – it uses cup measurements and I’ve always had it come out well. 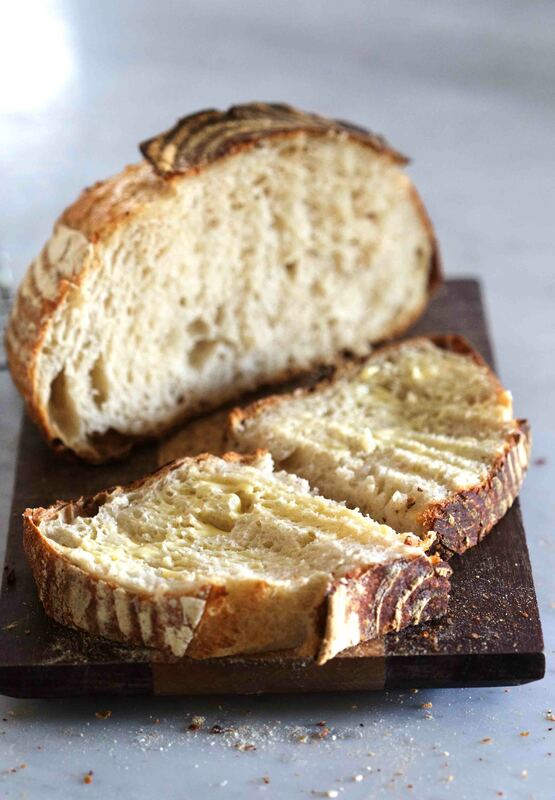 Learning to make sourdough is on my bucket list as well…but there’s something about it that’s so intimidating to me! I realize that’s ridiculous lol. You make it sound so doable! You can definitely do it girl- wish I could share some starter with you! King Arthur flour sells starter. It’s very good. I had success from my first loaf with it. I have neglected starter in my fridge that I’ve been debating reviving and this post with its beautiful pictures may just be the motivation I need. Looking forward to your knitting post. What is your Ravelry name? Thank you so much for this info! I am audrafullerton on Ravelry. I hope to get that post up by the end of the week! 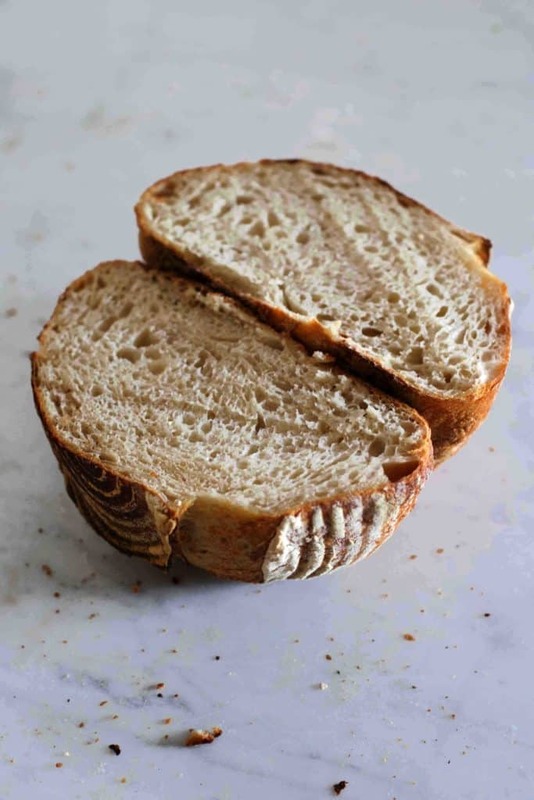 I really want to learn to make a real sourdough but in the meantime, I have a “faux sourdough” recipe that does not use a starter but instead uses instant yeast and plain Greek yogurt and it is the BOMB. Proofs in the Instant Pot and is ready start to finish in under 6 hours. Tastes amazing. Bookmarking this in case I ever get motivated to make a real one! What a brilliant idea this is! Really magnificent. Keep this up. Thanks a lot.